Valentines Day is tomorrow and I will be surprised if Ice Sculptures in front yards are not the biggest hit this Valentines Day. When we get through playing in the ice, come on in and warm up with some wonderful Valentine treats that all of you are bringing. I can't wait to see what you will be sharing today and hope you will share with us what your plans are for a Valentine Treat. I am sharing my Tiramisu Parfait with you today, hope you enjoy it. Helen, Thank you so much for featuring my curry cauliflower. I did not think anyone else would appreciate it as I do. As always thank you for hosting. Thanks for hosting!! Have a great rest of the week! Thanks for another great party, Miz Helen!! Wow, more ice and snow? This winter is endless! Stay safe and keep warm, Miz Helen! Thanks so much for hosting. 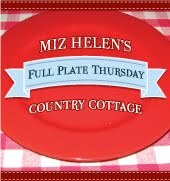 Thanks for hosting each week Miz Helen. I hope those ice sculptures in your yard don't mean you have an ice storm. Ice sculptures sound lovely… sorry to here you're getting hit by ice. We are in the middle of a Nor'Easter right now.. doesn't look too bad yet… I'm staying warm checking you your party. Thanks for hosting Miz Helen and have a great day!! Love this party :-) Thanks for hosting it Miz Helen, have a great weekend! Thanks for the party! There is so much great Valentine's stuff to look at up there. Best wishes for tasty dishes! I hope you have a lovely Valentine's Day and that you guys thaw out soon! Thanks for hosting! Thanks for another fantastic party Miz Helen. Happy Thursday. Love all the recipes today. Thank you for hosting. Thanks for hosting this wonderful party and thanks so much for featuring my Baked French Swirl Toast. Hope you have a special Valentine's Day and a great weekend! Thanks for hosting, Miz Helen! Happy Valentine's Day! Thanks for hosting Ms Helen. I've been busy with a sick friend and completely lost track of days. I shared my favorite corn muffins. See you on time next week! Finn sends his Valentine's Day kisses to Max. Thanks so much for the lovely mention!! I've been a bit under the weather and unable to join in this week. I am starving right now and wow, so many great recipes!